This year marks the 100th anniversary of Alfred Russel Wallace’s death. I read a biography of the man a few years ago, and discovered a fascinatingly driven, indefatigable scientific adventurer, who shared Darwin’s dedication to scientific rigour, if nothing else. 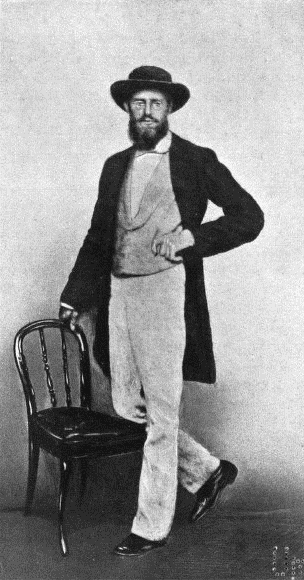 Far less ‘high-born’ than Darwin, he spent much of his early life living by his wits, which, luckily, were plentiful. He also spent a lot more of his early scientific life engaged in exotic field work in South America and the islands of south east Asia, suffering various illnesses and accidents and relying on precarious local hospitality. It was in the Spice Islands (the Malaku Islands, in what is now Indonesia) that, feverish with Malaria, he was struck by the essential concept of natural selection. Fever upon fever, what a moment that must have been! (Killjoy researchers, though are casting a sceptical eye on this romantic story – truth and romance – what an eternal battle). I was thinking that it’s a shame, considering all that he must have experienced and reflected upon in those far-from-home years, that we don’t have from Wallace a travelogue to match Darwin’s Voyage of the Beagle – which I also read a few years ago and which is one of my all-time favourite reads. However, I’ve recently been reminded that he did write such a travelogue, The Malay Archipelago, which was enormously successful in his lifetime. I plan to read it this year, in honour of Wallace, just as I read Darwin’s book to mark the bicentenary of his birth in 2009. Also because they’re less tough reading than The Origin of Species (I got through about a third of it, many years ago) and Wallace’s Contributions to the Theory of Natural Selection (1870) and Darwinism (1889), which one day I might get to. Meanwhile, it’s just been announced that about 4000 of Wallace’s letters, constituting some 95% of his surviving correspondence, have been brought together in a magnificent online project. Check it out. « GM salmon: what to think?